The Chevrolet Blazer was one of the most popular SUVs for five consecutive decades, though its name was shared by two completely unrelated model lines. Chevrolet first started affixing the "K5 Blazer" designation to two-door convertible SUV of its big trucks starting in 1969. 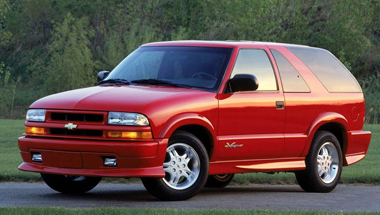 The Blazer was the smallest full size SUV of the General Motors C/K Trucks. It was replaced in 1995 by the Chevrolet Tahoe. In 1970, GMC introduced its own model of the truck, called the Jimmy, which lasted until the 1992 GMC Yukon. Both were based on the short wheelbase trucks and were available with either rear-wheel drive or four-wheel drive. The Blazer's long wheelbase relative (with an integrated rear body, and doors for 2nd row passengers) is known as the Chevrolet Suburban. The K5 Blazer and Jimmy had "full convertible" removable tops until 1975. In 1976, GM introduced a half-cab design that was less prone to leaks and slightly safer in a roll-over. These half cabs are convertible starting at a few inches behind the driver/passenger doors all the way back to the tailgate. In 1992, the Blazer was redesigned completely and no longer had a removable top.The original Blazer and Jimmy remained in production until 1991. All Blazers are powered by a 4.3-liter Vortec V6. This 90-degree V6 has a cast-iron block and head and overhead valves, and runs happily on 87 octane gasoline. Although redlined at 5600 rpm, it reaches its peak 190 horsepower at 4400 rpm. And, with a very useful 250 pound-feet of torque at 2800 rpm, there's little need to rev it into the red. GM's four-speed electronic automatic transmission is standard on four-door Blazers, although a five-speed manual transmission is available on the two-door models. 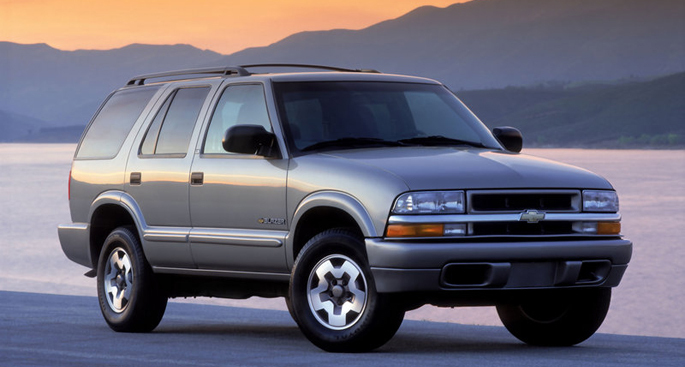 The second-gen Chevy Blazer's mechanicals were largely consistent throughout its lifetime. Under the hood was a 4.3-liter V6 producing 190 horsepower and 250 pound-feet of torque. It was typically connected to a smooth-shifting four-speed automatic, though a five-speed manual transmission was available on two-door models. The Blazer initially came in three trim lines: base, LS and LT. The base model started with little more than a radio, air-conditioning and antilock brakes, but the LS features power windows and locks, a tilt steering wheel, a folding rear seat, and cruise control. The luxurious four-door-only LT upgraded to leather upholstery, a power driver seat, Chevy Blazer Accessories, a more deluxe stereo and an overhead console. Four wheel disc brakes are standard, and the braking system was upgraded for the 2000 model year. Five-spoke 15-inch aluminum wheels are standard on the basic LS model, while the Xtreme gets 16-inch rubber on deep-dish alloy wheels. The sporty low-rider Xtreme features an aggressive exterior with flared fenders, lower bodyside cladding, deep-tinted windows, fog lamps and a body-colored grill. 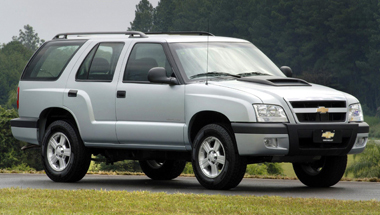 Of the few changes to affect the Chevy Blazer during its long life, the most crucial came in 1998 when it gained revised inner and outer styling, four-wheel antilock disc brakes and a passenger-side front airbag. The addition of a second airbag is especially important in light of the Blazer's very poor NHTSA one-star frontal crash test score for the passenger in prior years. After the revision, the score jumped to four. Another major change came for the 1999 model year when Chevrolet introduced a new AutoTrac four-wheel-drive system that could automatically sense wheel slippage and send power to the axle with the most traction.